It is important to know if you have rabbits in or around your garden so that you can take precautions to prevent them from eating your lettuce before you get a chance to harvest it for yourself. How do you know if there are rabbits around your garden? Actual rabbits. Especially in the springtime, you may see rabbits early in the morning hopping around the garden. Foliage half eaten off. 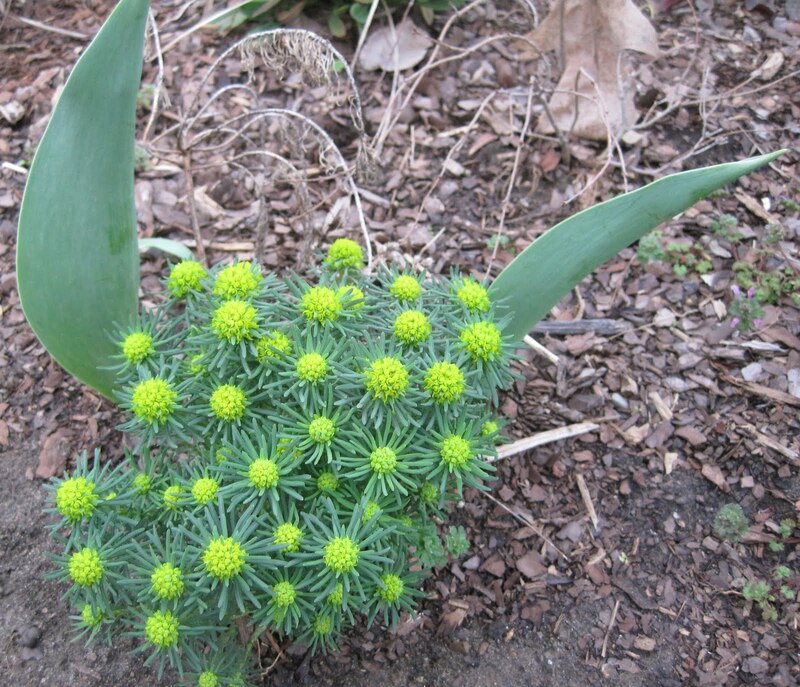 Tulip foliage and any expensive, rare perennial, plus tender new shoots in the vegetable garden, are favorite foods of most rabbits. Rabbit droppings. Look in the lawn and other areas for rabbit droppings, which look like, well, rabbit droppings. FYI, if you actually raise rabbits and collect all the composted droppings to use as a garden fertilizer, you should then refer to the droppings as "rabbit manure". 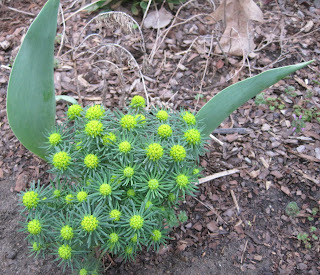 Notice how the two tulip leaves represent rabbit ears and the Euphorbia in between is shaped like the head of a rabbit. This is the usual form of these rabbit ritual altars, though they can take other forms. No one has ever seen or documented the actual ritual that the rabbits perform at these altars, but it is widely known that following the ritual, the rabbits gorge themselves on anything and everything in the garden and then carry on well into the night with near riotious rabbit merry making. If you see something like this in your garden, there are definitely rabbits around! Many rabbits! Get out your plastic spoons and forks and arm yourself for battle! Rabbit ritual altar made me laugh out loud! Love it! Carol - as you can imagine, Bunnies/Rabbits are a topic very near and dear to my heart! The "Rabbit Shrine" is just the best!! Hilarious post. The rabbit altar made me think of Watership Downs for some reason! We have all the signs except the altar. Are you sure that's not some fairy trick? I have no rabbits. But I want an alter like yours anyway. It's too cool! Hilarious! I have all the rabbits signs, well except for that awesome alter. How cool is that! Hi there! I have been following your blog for a few weeks now, and just wanted to tell you that you inspired me to write my own : ) It's not quite as exciting as yours yet, but one day maybe! I look forward to your post and get so excited when I see there is a new one. Thanks for blogging :D It makes my day! RABBIT ALTAR! rotfl On a more serious note. I will have to stroll around tomorrow and see if there is any such evidence of rabbits in my garden. I have been inspired to find something of the sort. LOL I've never seen the droppings, but have seen lots of rabbits, and their damage to my plants. I used to plant extra lettuce, especially romaine for them, but they like to chew bits of of all of the lettuce plants they can find. I think I saw a couple droppings on a crate we had outside on the deck over the winter, the other day, though.